On 23 October 2015, The Hague Project Peace and Justice and its partners have kickstarted the celebrations of the 70th anniversary of the United Nations (UN) by organising a series of events titled ‘We, the People’ throughout the course of the day and presenting the first draft of the Hague Manifesto on the occasion. 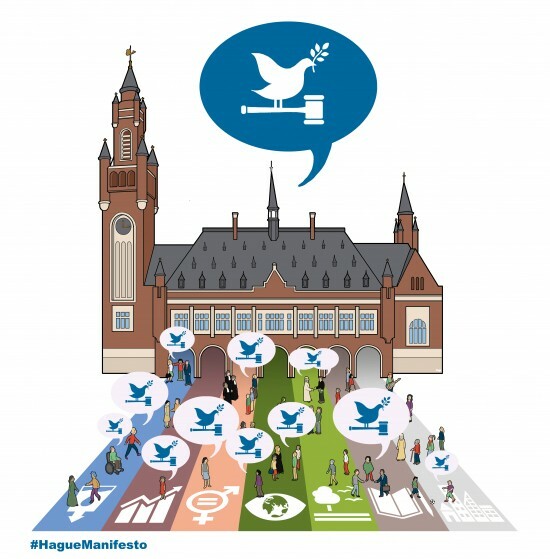 Developed by young academics and a cross section of the international community in thematic working groups organised by the Hague Project Peace and Justice, the Hague Manifesto is the beginning of a determined effort to contribute to the implementation of the UN Global Goals for Sustainable Development, paving the way towards their full realisation by 2030. The Hague Manifesto is a tribute to the important work of the United Nations and the newly adopted UN Global Goals. The Hague Manifesto is presented today in its first draft outlining the 7 principles taking forward the actions, such as the engagement of engaging all actors through effective partnerships to advance Global Goal 16 and the wider Agenda 2030, including within civil society, the business community, governments, inclusive and independent media, academia, faith-based, community-based and international organisations. In particular, local communities and the younger generation need to be engaged directly in these partnerships. The concrete actions will be defined over the course of the coming weeks, based on further dialogues with the international community. The Manifesto outlines the strong belief that the UN Global Goals will spur dialogue and cooperation among people and their organisations, from the local to the global level. As UN Secretary General Ban Ki-moon said during the Sustainable Development Summit: ‘The true test of commitment to the new Global Goals will be implementation’. The Hague Manifesto aims to contribute to this implementation process. Emphasizing Goal 16, it aims to leverage the unique role of the City of The Hague, the City of peace & justice. The Manifesto offers a framework to support an open discourse between all the relevant actors with a view to identifying, prioritising and implementing concrete action supported by informed societies.